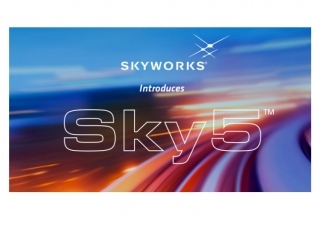 Skyworks is pleased to introduce products from its breakthrough Sky5™ platform enabling 5G connectivity. These advanced wireless engines include highly integrated, high performance transmit/receive front-end solutions as well as diversity receive (DRx) modules. They are designed specifically for new spectrum in the sub-6 GHz range, are baseband agnostic and compliant with 3GPP standards. Additionally, they offer a MIPI® interface and are highly flexible with customizable architectures to deliver exceptional performance, footprint and power efficiency. 5G NR power amplifier module with integrated filtering and dual path low-noise amplifiers (LNA) supporting N77, N78, N79 and B42, B43, B48 bands. This device also utilizes SkyBlue™ technology and integrates a dual antenna output. 5G NR diversity receive module with integrated filtering and dual-path LNAs supporting N77, N78, N79 and B42, B43, B48 bands. This device also incorporates a dual antenna interface. eLAA front-end module with a dual-mode power amplifier and simultaneous LAA/Wi-Fi receive functionality (planned release late 2018). Cellular Vehicular-to-Everything (C-V2X) front-end module with Class 2 power and integrated gain control (planned release late 2018).